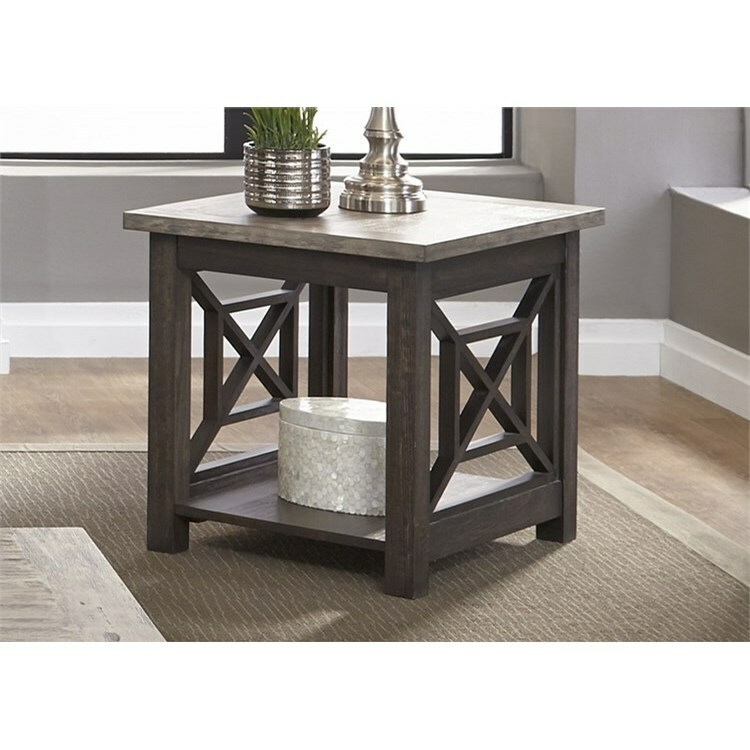 Showcasing unique side design accents, this end table will complete your transitional living space. Crafted from wood and veneers with a two-tone finish, the table features a bottom shelf to accommodate books, valuables, or other small living room items. Well-crafted, this table will serve you and your family well for years to come. The Heatherbrook Occasional End Table with Bottom Shelf by Liberty Furniture at Miskelly Furniture in the Jackson, Pearl, Madison, Ridgeland, Flowood Mississippi area. Product availability may vary. Contact us for the most current availability on this product. Warranty Manufacturers warranty is one year from the date of purchase. The warranty will not apply to damage arising from neglect, accidental or intentional damage, freight damage, institutional or commercial use, damage or wear due to exposure to extreme sun light, temperature, moisture or humidity. Crafted from wood and veneers, these beautiful occasional tables will complete your living room settings. Exceptionally accommodating, the tables feature a bottom shelf for additional storage and are accented by unique side designs. With block legs and a two-tone finish, these tables add lovely transitional accents to your home. The Heatherbrook Occasional collection is a great option if you are looking for Transitional furniture in the Jackson, Pearl, Madison, Ridgeland, Flowood Mississippi area. Browse other items in the Heatherbrook Occasional collection from Miskelly Furniture in the Jackson, Pearl, Madison, Ridgeland, Flowood Mississippi area.